실버 판다는 미국인들의 사랑을 받고 있습니다. 국립공원의 중국 자이언트 판다 40주년을 기념하여, 중국 조폐국과 스미소니언 협회는 이 사상 최초의 특별판 판다 실버 프루프를 출시했습니다. 5온스 999 프루프 순은으로 압인된 각각의 스미소니언 판다 실버 프루프는 국립공원의 판다 한 쌍-메이시앙과 티엔티엔-을 묘사합니다. 5온스 2014 중국 판다 스미소니안 협회 NGC PF-69 울트라 카메오 은화 실버 판다는 미국인들의 사랑을 받고 있습니다. 국립공원의 중국 자이언트 판다 40주년을 기념하여, 중국 조폐국과 스미소니언 협회는 이 사상 최초의 특별판 판다 실버 프루프를 출시했습니다. 5온스 999 프루프 순은으로 압인된 각각의 스미소니언 판다 실버 프루프는 국립공원의 판다 한 쌍-메이시앙과 티엔티엔-을 묘사합니다. The obverse of each depicts the Great Wall of China alongside the iconic Smithsonian Castle on the National Mall in Washington, D.D. with the words "Smithsonian Institute 2014" engraved around it. 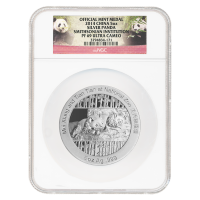 The reverse features a depiction of Mei Xiang and Tian Tian at the National Zoo in their habitat with a bamboo background and the words "Mei Xiang and Tian Tian at National Zoo 5 oz Ag 999" engraved around it.